Fashion is defined as popular trends, especially in styles of dress or in the manner of behaviour. It makes people feel good about themselves. It boost their confidence, and in some instances, it feeds their ego. Most popular dressing trends had been designed to cater for slim or skinny body structured people. 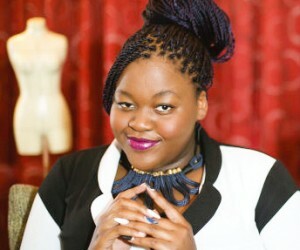 In the midst of the bias connotations that popularly define beauty and fashion—with the exclusion of plus size women, Bonolo Mataboge, with her entrepreneurial gift, she saw a thriving business opportunity. She is a 21 year old ambitious, creative, intelligent and humble youth from Johannesburg. She grew up in different places like Eastern Cape, Mpumalanga, Western Cape and Johannesburg, where she was born. She attended Rosebank Primary, then went to Cape Town and attended Reddam House Atlantic Sea Board and Pinelands High where she obtained a student exchange opportunity to New Ulm, Minnesota and Milford, Nebraska in September 2011. “It was a great learning experience and a good test of my will to achieve a goal. I made a lot of great friends from all over the world—and even got the opportunity to go on a trip to Washington DC, Philadelphia and New York,” says Bonolo. She returned in June 2012 and went to Abbots College Century Gate where she matriculated with six distinctions. She went to LISOF Fashion School, but had to drop out by the end of first semester due to medical reasons. “After dropping out, I started a blog about the ex-fix and then launched my brand in September,” says Bonolo. During her exchange programme, she found shopping to be way easier than at home, because of all speciality plus-size boutiques. 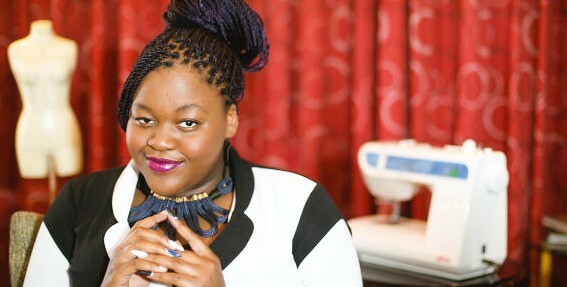 It was then that she decided she would be a fashion designer, and cater for plus-size women. “In Grade 11, our final design project was called My Design Business—and we had to come up with a name, logo and product. I came up with a plus-size clothing line, which would be called African Blossom. I’ve always believed in woman empowerment, and I wanted my business to be for women by women, and I wanted my logo to represent that, so I came up with the concept of a stylised female figure repeated in a circular formation,” says Bonolo. Over the years, she had refined the business concept to an African, unique plus-size women’s wear brand for cosmopolitan African women. “AfriBlossom is unique because we cater for an under served market (plus-size), we offer a hybrid range that bridges the gap between African and western clothing, and we cater for a broad range of ages (20-50)—as we discovered that the mature plus-size market is catered for, but the youth market finds what is currently available aging and dull,” she says. Bonolo alludes that AfriBlossom is the shortening of African Blossom. “The idea behind the name is that Africa is a cherry blossom tree that is slowly growing, and in need of love and nourishment; the nourishment in this case being entrepreneurs and small businesses to help it grow. When the day of its bloom comes, AfriBlossom will be one of those blossoms on the tree of African potential. The name AfriBlossom defines the brand’s essence of African patriotism, transformation and beauty,” she says. She admits to be fortunate to have a mother who was able to fund the first six months of the business. When she expanded the business she sought funding from the NYDA. “My initial struggles were learning the ropes of the business and putting the correct systems in place from the beginning. One of my biggest lessons was that—you need to know what’s happening in every aspect of your business. When I started, I had a mentor/production manager who sold my designs to other people and disappeared with half the stock I ordered. I lost over R50 000 and had to recover quickly without his hand holding, which I had grown too accustomed to,” says Bonolo. She admits to have paid for that mistake for a period spanning six months, because all the sales projections were based on the expected stock. “I now make sure I know everything I can about what is going on in my business, and if I outsource, it will be after I have done the job myself, so I know what the job entails and can supervise effectively,” says Bonolo. Bonolo confesses to have chosen big size clothing designs to solve a problem that she is passionate about by solving a problem that she and many other plus-size women have faced for decades. “I chose plus-size fashion because I love design, and to create, and the numbers make sense. 69% of our adult women are classified as overweight, and the average woman wears a size 38. "We are Africa’s 'fattest' population and it makes no sense to produce masses of clothes for the smaller part of the population—while everyday plus-size women walk in and out of stores with their money still in their purses because there is nobody prepared to cater to their needs—because of western beauty standards which don’t make sense in an African market where our women are naturally gifted with curves. Her favourite fashion designers are: Kathrine Pichulik’s who owns Pichulik, and Tamara Cherie Dyson and Anisa Mpungwe, who owns Loin Cloth and Ashes. Bonolo feels that Africa is overflowing with talent and potential. And that there is a need for good mentorship, nurturing environment, sector specific support and infrastructure. “I think young African designers need help in balancing being an amazing artist/creative with being commercially viable. That is the missing link,” she says. She had an opportunity to showcase at the Mercedes-Benz African Fashion Festival in Accra last year. "It was my first trip into Africa and a big show. Being the youngest designer there, I think it was a great learning experience because I saw all the chaos and sweat that goes behind the scenes to create the spectacular shows that we enjoy, and I got to get advice and knowledge from far more experienced designers from all over the world, and I think it helped my development tremendously, and I hope our new collections reflect that,” says Bonolo. She cites that innovation in business is important because it sets one’s product apart from the rest and provides staying power. “At AfriBlossom, we ensure this by keeping up to date with upcoming trends, coming up with fashion-forward designs, and getting as much feedback and information from potential customers as possible through social media. I believe you are truly innovative when you understand your customer so well that you know what they want/need before they know they want/need it,” she says. Bonolo learnt that in business one have to go out and get what one need. “I truly believe in asking, whether it be advice, information or an opportunity. Nobody is going to hand it to you on a silver platter. You can get a lucky break, but you need to back it up with hard work. You are amazing to your family but to the rest of the world, you’re just another face, and you have to make it memorable for all the right reasons. People work with people they like, so make your first impression the best,” she says. Bonolo was diagnosed with Blount’s Disease when she was seven years old. Blount’s Disease is a genetic disorder which is most common amongst African females. Blount caused her legs to bow and left leg to grow faster than the right leg. She had her first surgery when she was eight, and it exacerbated her condition; the left leg grew much faster and bowed conspicuously—causing a limp. “Kids were very cruel and I was bullied relentlessly; and one day I snapped and beat up my bully, which put an end to it,” she says. She then made a strong group of friends who gave her support, protection and helped her on her second surgery at the age of 12. The operation went well but it was discovered three years later that her leg was over corrected, and had stopped growing. She had the third surgery at age 15 to correct the damage. “So, after three failed corrective surgeries, I ended up with my left leg being 4.7cm’s shorter than my right. In December 2013, I had my forth surgery, external fixation to extend my left leg. The surgery entailed having my leg broken in two places, eight metal rods being drilled through my leg, and being attached to a four metal rings around my leg with adjustable struts, which were twisted to move my bones apart by 1mm a day to extend it by 4.7cm. This was a nine month process, and I contracted a serious pin tract infection which led to me having emergency surgery to have the infected pin removed, and that’s why I left school. “I don’t see my condition as a big thing, my mom made it a point to raise me as a normal kid that just had to have surgeries every few years. I’ve lived with it all my life, so I don’t know any other way. I just think I’m me and Blount is a non-factor. "I forget about it so often that I’m reminded of it when people asks me about my scars. I think if anything, Blount made me tougher; I have a very thick skin, a very high pain threshold and I don’t believe in letting my struggle become my identity. Bonolo feels that traditional businesses receive far better support than creative arts businesses. “Government needs to understand what it takes to make a fashion business commercially viable, find appropriate mentors and fund the ‘extras’ such as photo shoots, which we need to sell our products,” she says. Since this is the youth month issue, BBQ asked her opinion about June 16, and she says: “June 16 to me is a great example of how the youth has power if we work together towards a common goal, and that there is no progress without sacrifice. Ten years from now, she sees AfriBlossom having stores in all major cities in SA, the SADC and having stockists in specific countries that are in their target market. “I see us expanding into footwear and accessories, and supporting causes close to my heart like the treatment of children with orthopedic conditions—with the help of the Walk-A-Mile Centre for Advanced Orthopedics,” concludes Bonolo.